The Frontier of Anxious Identity | Rabbi Lawrence A. Hoffman, Ph.D. This address was delivered on May 16, 2017 as an acceptance of UJA-Federation of NY’s “SYNERGY Award for Synagogue Change”. SYNERGY established this award to recognize individuals who have developed innovative strategies that help synagogues adapt and thrive by meeting the changing needs of the Jewish community. In doing so, SYNERGY hopes to underscore the value of doing this work and inspire others to step into this space. Rabbi Hoffman was the recipient of this first of its kind award along with fellow honorees, Amy L. Sales, Ph.D., associate director and senior research scientist at Brandeis University; Rabbi Rebecca W. Sirbu, director of Rabbis Without Borders at Clal – The National Jewish Center for Learning and Leadership; and Isa Aron, Ph.D., professor of Jewish education at HUC-JIR Los Angeles. How honored I am to be here, among you, my valued colleagues — you who share my commitment to synagogues as the singular Jewish institution for American Jewish survival. No other institution comes even close to providing what Jews need to flourish in our time. We know from Jewish history, that Jews have flourished when, living in freedom, we have ridden the cultural waves of the host cultures in which we found ourselves. 16th-century Polish yeshivas, for example, were the Jewish equivalent of the Polish Renaissance, Cracow University and Copernicus. Rashi wrote sacred commentary, but so too did his French neighbors, the Christian school known as Victorines. What, then, has been the American cultural wave, if not a commitment to that unique form of religious life known as Congregationalism. In America, congregations matter. A second American phenomenon was the separation of church and state, depriving congregations of government support, and demanding that they innovate. American history is replete with religious competition, old churches that fail, and new ones that blossom. With 19th-century American expansion, for example, congregations formed denominational bodies so as to franchise member churches as the frontier moved ever West and South. Isaac Mayer Wise watched Unitarians do that at a conference in Cincinnati, and then put out a call for a Jewish Movement that we now call Reform. In our time too, we must understand the era and the innovation it requires. The foremost challenge of our time remains the passing of Jewish ethnicity, the idea that Jews are automatically conjoined at the hip by language, history, and memory – everything from Jewish food to Jewish foibles. Without doubt, that era is gone. Sociologist Marshall Sklare predicted it as early as 1955, when he studied synagogues and called them the Jewish equivalents to ethnic churches, likely to disappear within a generation or two. As ethnics, Jews belonged to synagogues as a matter of civic duty. But why belong now, when the language of the folk, Yiddish, is largely forgotten; when the new Jewish food is sushi; and when over 50% of the Jewish community will be born to at least one parent who has no Jewish memories at all. When Jewish ethnicity acquired a land (Israel) and a language (Hebrew) it became nationalism; living in America without the immediacy of either one, ethnicity becomes nostalgia, and as they say, nostalgia isn’t what it used to be. We all know the polls that show heightened interest in spirituality. When Synagogue 2000 was new, I used to say, therefore, that the secret to innovation today was an infusion of synagogue spirituality. I still believe that, but I have come to see that the situation is more profound. At stake is the changing nature of identity itself. The generations that knew Stalin and Hitler; that set records in attending college and winning Nobel prizes; that thrilled first hand to the miracle of Israel’s rebirth — that generation identified fully as Jews. Jews with no memory of any of this may also be happily Jewish – but happy being other things as well. There’s the rub: for ethnic Jews, Jewish identity was “a given” bestowed by birth. We were Jews not just by religion but by habit, culture, food, and humor. With modernity, we added in nationality – we were Jews by religion but Americans by citizenship. Nowadays, we have added other things: gender, politics, vocation and even avocation. “I am an American, a husband, a lawyer, a tuba player, and, I guess, a Jew,” a young man told me not so long ago. The age of ethnicity has become as age of fractured identity, where we struggle to decide what aspect of identity takes priority and when. But identity comes layered. Our surface identity is what we answer to officially: our name, address, and social security number. Deeper than that is our list of passwords, the things people hack to “steal our identity.” Deeper still are the roles we play: mother, friend, professor, volunteer, feminist, and runner. Young men and women today face the question that never would have occurred to me: how important in all this is being Jewish? And what exactly does Jewish identity do? The answer accesses the deepest level of human consciousness: our identity as a self. Strip yourself of job, marital status, and all the rest, and what is left, when you gaze into the mirror? When we die, and can show up for none of it, how will we be eulogized? Or while still alive, what deepest lessons do we pass on to our children. This deepest self is what philosopher Charles Taylor calls “the self in moral space”; what another philosopher, Daniel Dennett, calls a “center of narrative gravity.” Who are we, when we think of ourselves as the central character in our life-narrative? What is the most important story we tell about who we think we are? What is left when we age and find slowly that all else is gone? In this age of anxious identity, everything stands or falls with these centers of moral and of narrative gravity – something that synagogues alone can provide. Spirituality is more than just yoga, quietude, and self-care. It is the deepest satisfaction we get from the discovery that we do indeed have a core identity: that we are part of an eternal story that began before our birth and will continue after our death. The search for spirituality is, therefore, centrally bound up with the search for core identity: again, something synagogues alone are naturally outfitted to deliver – because core identity comes not in isolation, but through a community that connects us to something larger than ourselves: a set of ultimate principles; a master narrative in which we are a character; And a language with which to speak the deepest truths about them both. Looking back on the several decades of synagogue transformation, I see two streams of intervention. The first is understandings borrowed from secular life: business schools, consultancies and organizational development. 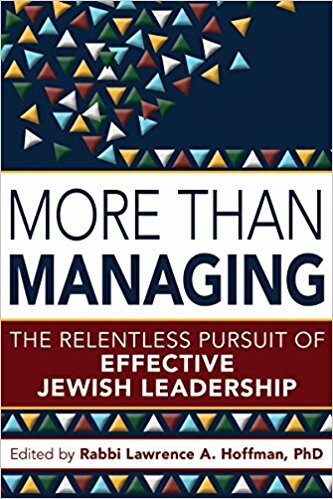 The second is the effort to transform what synagogues actually do: learning, say, or worship. Without doubt, these still matter – profoundly. But there is now this new frontier as well, the Frontier of Anxious Identity, the sense that even synagogues that run with all due organizational efficiency, even those that attend carefully to education, pastoral care, worship and so on, even they must inevitably fail if they do not think of themselves differently than ever before. Synagogues must be not just relational but deep. They must self-evidently stand for something profound, and have the language to express just what it is they stand for. They must promise a moral and narrative core that gives life meaning. Have you forgotten the Havurah movement and its strong influence on synagogues like Beth El of Sudbury Massachusetts led by Rabbi Lawrence Kushner? That began 50 years ago and has flourished and spawned other similar spiritually-inspired congregations throughout the country. This includes Temple Micah of Washington DC of which I am a proud member. I have not forgotten at all. I was a speaker at the first National Havurah Conference, on a panel with (I think) Art Green. A rabbi in the crowd published an attack in Moment Magazine accusing me of being an enemy of rabbis and synagogues! Hard to imagine now. I was surely never that! But people were indeed threatened then by what they saw as a dismantling of structures as we had known them. The best of Havurah movement was eventually coopted by synagogues — to make themselves stronger. Synagogues should welcome creative challenges now just as they should have then. Protectionism never works in a free market, and religion in America is a free market. Thanks so much! I do appreciate your following what I write.